Pan American Airways was the first to establish a permanent settlement on Wake Island. 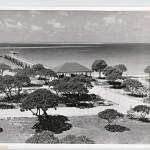 Late in 1934 the commercial airline obtained permission from the U.S. government to build stations on Wake and Midway Islands for its transpacific Clipper operation. Protected lagoons offered calm waters for seaplane runways, though divers would have to blast many coral heads and shelves for safe depths. When operational the mid-Pacific stations would provide vital links in the chain linking the West Coast and Asia. The North Haven, Pan American’s supply ship, set sail from San Francisco in the spring of 1935 to initiate operations and prepare its bases in the Pacific: Honolulu, Midway, Wake, and Guam. Wake was the only uninhabited and undeveloped location and proved to be an enormous challenge. 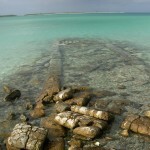 The encircling coral reef allowed no navigable channel into the lagoon and was too shallow for ships to anchor. Wilkes proved to be the only viable location for landing operations, but was not suitable for the PAA station itself. Peale was chosen for the base, meaning all cargo and equipment would have to be ferried across the lagoon. Workers built a light-gauge railway across Wilkes to move cargo to the lagoon side. Light barges and boats, laboriously pulled by workers through the shallow Wilkes channel, were soon carrying supplies to Peale as blasters attacked the coral heads in the lagoon. 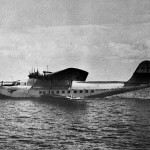 The Pan American base took shape quickly and the first Pan American Clipper landed on Wake’s lagoon on August 17, 1935. By 1936 Clippers were making the full round trip to Manila and back. 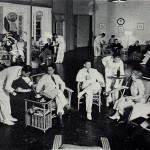 A fully equipped, stylishly decorated hotel stood on Peale for passengers and crew. The quiet ambience on Wake was disrupted in 1941 with the arrival of the American contractors whose numbers swelled as they began to build a seaplane base for the navy. “Pan Air” and the contractors developed a mutually beneficial relationship over the months. The Clippers carried many airmail letters between homesick workers and their families. Pan American’s operations ceased abruptly when war came to Wake. The last bullet-ridden Clipper lifted off the lagoon on December 8, 1941, as fire raged over the bombed hotel on Peale. Soon after the war, Pan Am resumed operations on Wake, building new facilities and utilizing land runways. The Clipper days were over. Today only a few remnants remain of the bustling Pan American station on Peale. 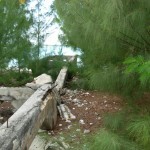 Concrete foundations peek out from the brush; parts of the pier that once stretched from the shore out into the lagoon still stand. 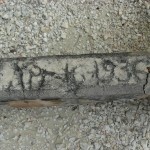 A stone brick etched by an anonymous worker in April 1936 invites the modern visitor to reach back into a bygone era when the only reason anyone knew anything about Wake Island was because it was one of the island pearls in Pan American’s Pacific necklace. Thank you for posting these Bonnie, new photos always welcome. Awesome Pictures and awesome research! Good work Bonnie!